Developer Diary 15 – Game On! You can tell from the big screenshot below that all the game elements are in. That means it’s game on… finally. If you’ve been following this blog thinking “is this thing ever going to happen?” well, perhaps you were not alone. Moving the game to our own 3D engine (written in python!) was difficult and, at times, scary. We’ve completed it though, and I’m happy with the results. I understand there will be people who take issue with 3D presentation as such. Feel free to unload in the comments 🙂 though obviously we’re way beyond the point of no return now. We are using jaggy, irregular patterns for weather boundaries – check out the edges of the snow patch in the screenshot below. This is different than UoC1 where we used patterns that were more noisy in nature. These patterns (based on perlin noise) didn’t work so well in 3D, so we’ve come up with this new stuff. Overall I think the effect is similar: they match the hexes well while still maintaing an organic look for the boundary. Time needed to re-load the weather is now 2-3 seconds, which is good news if you found load times in UoC1 frustrating. You could be waiting for 30 seconds (or more) to start a new turn in UoC1, and re-loading the weather was responsible for most of the wait. No more! Otherwise, the weather remains as it was: dry, mud or snow. The one change is that there will be less mud in western Europe. We are simulating countries with more developed infrastructure, and the effect of mud was never quite as debilitating in the west as it was with the Russian rasputitsa. The weather engine is taking this into account by creating considerably less mud in the west. We’ve been cheerfully over-engineering the UI since, like forever, so it’s refreshing to see that come online as well. It’s an intricate design rendered in vector graphics, laid out with flexbox and styled with CSS. I really hope people like it. We are also taking care to softly animate all the UI transitions, to give the game a contemporary feel. The UI should be scalable in theory but I haven’t really gotten around to testing that yet. Eventually, you will be able to zoom-in the UI separately from the map. No more squinting at tiny fonts, ever. 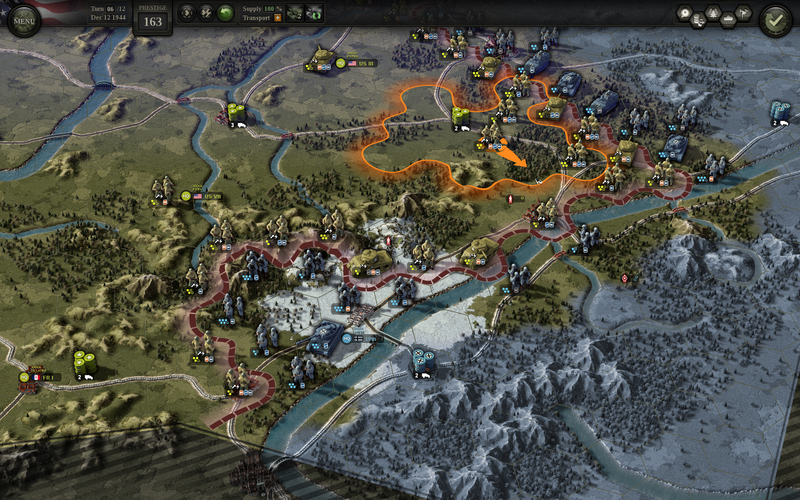 HQs have been added to the map – you can read all about them in a previous diary. 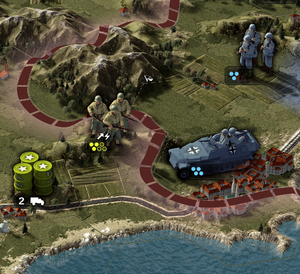 A unit can be placed in the same hex as an HQ, as you can see with both US army HQs in the screenshot. In comparison, the Free French 1st Army is alone in its hex – we’ll be placing a general there in such cases, perhaps with a flag pole, we’re still discussing the right approach. Barrels represent supply hubs which can co-exist with both units and HQs in the same hex. We don’t have a situation with all three stacked in the screenshot but this is allowed as well. Note also that you can see German supply hubs even when they’re inside fog-of-war. This illustrates a core design principle: there’s always some information visible from within FoW, it’s never completely blacked out. If you spy very carefully you will also see stragglers, which represent forces effectively out of your control (due to becoming disorganized in combat, for example). They play a big role in making the rules “less bloody” as described all the way back in Dev Diary 1 (!). Stragglers really deserve a post of their own, so let’s say this is a tease and leave it at that for the moment. The map now has lakes – previously we failed to import them from GIS and somehow didn’t notice that lake Ladoga was missing. The map editor has new desert and tundra terrain, and there’s even a GIS vegetation layer to help with placing forests. We’ve moved the game to 64-bits, meaning you’ll need a 64-bit OS to run it, which you most likely do. We’ve added explosions (yay!) and a bunch of new sounds includings tanks finally squealing properly. I know some people were concerned about that. The code that’s meant to create tank tube blasts for now just shoots ping pong balls. I’ve grown fond of the effect. 48 Responses to Developer Diary 15 – Game On! Looks awsome, certainly adds atmosphere. How many of you are working on the game? Can you give us a more specific release date now that nearly everything is in place? This looks great! Will the Eastern Front get a similar makeover? @iv: all in all about 6 people, when you add up various full- and part-time contributions. I have to think about a release date but yeah, it would be reasonable to provide one now. @Christopher: thanks! Yeah, the plan is to go East on the same engine. If I’m allowed just one (and only) criticism about the graphics: the roads and railways are equally ‘fuzzy’, it seems. I noticed that in a previous screenshot already. You’d expect railways to be straighter and smoother, which would make the two easier to distinguish at a glance. Just for your consideration. @Marko: it’s already on the TODO list. The plan is to do exactly as suggested: railways very straight, then paved and unpaved roads progressively more fuzzy. This will be back in our focus eventually, for now it’s “good enough”. I don’t think you will hear one complaint if you tack on a few extra bucks to cover OT to get it released AS SOON AS POSSIBLE!! It’s been a long wait but looks like it’ll be worth it. I really can’t describe how much I love UOC – I must have played through Taifun alone 50+ times. Great, happy to hear you’re on top of everything! It’s definitely good enough for now. I love the update, good luck! I’ll keep on following, avidly. I am terribly disappointed it is not already in my grubby mitts 🙂 Well done. Can’t wait. Will we se other nations in game? UK,Canada,Polish,Free french among others, or just US? Cant really imagine the western front without all the allies, it was really a joint effort. Add in my “looking awesome” commend as well, the original was (is!) one of my fave WW2 strategy games and I’ve been reading these Dev Reports for … a while ahaha … but loving the work and know it will be awesome once it is with us. @aren: all the nationalities will be there. You can already see the Free French 1st Army HQ in the screenshot (though we’re using US soldiers temporarily as a placeholder for FF units). Any info on Airforce? Thanks. I thought fighters for strafing and bombers for… well bombing. lol. Looks great. When do you expect to start Beta? Impressive, the battlefield look very clear ! – we had also fog of war or smoke during battles ? – there is a strategic map, or only zoom in / out ? – And the editor is already present ? Yep, auto-buy for me day 1. I’m no fan of 3D, and still prefer more minimalistic looks, but this does look really good. You guys haven’t sacrificed design integrity. Interesting to see a theatre-wide transport pool. Also interesting that most units in this Colmar Pocket (Nordwind?) scenario are 3-4 steps. US will have to be pretty careful with casualties, not a lot of manpower to burn. As in real life! Just one question (for now! ): what is the functional difference between an orange border and a red border? How is the multiplayer aspect doing? @Taylor, Basem, Jarin: thanks! No release or beta dates just yet, but obviously we’re closer to that then before. * the full map is bigger than UoC1 – approximately from Iceland to Arabia. Scenarios should be about the same size as in UoC1 – you can see how we draw the border of unplayable area at the bottom of the screenshot. * there is a campaign (strategic) map as well, yes. Theater-wide transport pool is used for supply hubs, I will talk about it more in future diary entries, or you can check my earlier supply post if you want. @Happy: orange is your movement outline (like in UoC1) – how much that selected US infantry unit can reach. The “red border” is the front line (used to be drawn with a hatch pattern in UoC1). Blue is fog of war. @Christopher: not very advanced yet :/ There will be multiplayer, there will be a better “lobby” for it, and there will be more dedicated scenarios but overall it’s not a priority. I’d love to read a dev diary about the decision to expanding your in house engine instead of moving to Unity or some other engine. Can t wait…need this game. Loved the first one. I hope this will also have a Linux release as it’s what I play on, but if not I wish you good luck all the same. I feel there are many actual benefits to running your own engine, but that could just be survivor bias talking. To be honest, I’m not sure if I’ll ever have the heart for a proper dispassionate analysis of the subject. Linux is not a priority, but porting is usually not a big effort from the technical side. I expect us to support it. You should add an option in the options menu to use Ping Pong Balls instead of real tank bullets! Like a Kid-Friendly version of the game. I’m extremely excited for this game, no telling how long my face will be glued to my screen while I play this. However, I would like to ask for one thing, and one thing only: In UoC1, I would create my own scenarios, and a lot of the time, the movement of the mouse between the unit properties and the actual units themselves just would take too long. I would love to see keyboard shortcuts for the Scenario Editor as it would drastically reduce clicks and time required to edit units on the battlefield. One of the best things to do would be to keybind entrenchment to E in the editor, so you don’t spend 5-10 minutes trying to make sure every unit is dug in. I hope we see the game this summer. Keyboard shortcuts are supported in the scenario editor. Currently though, the entire scenario editor is hotkey-based (hey, don’t judge us), so if we omit a particular shortcut you’d like, please ask on the forums when the time comes. Do you use independent animation for turns separately for the turret and the chassis for tank units? Something like the direction of movement and direction of firing. first at all a big praise for your work on UC1. I played it about 545 hours according to steam. I read in a post thats your opinion is: a wargammer need no archievments. My hardest personal archievment was to win all battles in brilliant without using prestige points. I costs a lot of time, annoy and a couple of time i cursed you because of the good KI. I hope you will implemente archievments on steam. Take all you time you need for develop UC2. The screenshot promis a lot. If you make a 2D version, that would be cool also. @Intenso: turret can move independently from the chasis, but this is only used for visual effect. Direction in which the unit is facing does not play a role in the game rules. @Lanark: thanks! We will have achievements in UoC2. @tom: Thanks for the reply. Are there any planes to have a simple rating system post launch? I’ve played a lot of panzer corps the last years but sadly there are no games within the genre that I’m aware of that supports competitive play :/. Like most everyone else…love it and am ready to give you money today. In fact, I checked on the site almost randomly since it had been a while since I had heard anything. Playing another game currently, but mostly because I don’t have another great UoC game to play. I saw that you already said you had no idea about a date, even for Beta, but can you say if it is going to be in 2018? And if yes, then “by summer” or “by fall” or “by Christmas”? Please please unlock Turn Limits. How hard can it be? I always get through the entire game(s) within a few weeks, play it over for months, and then the little kid in me actually to dream – and play a map like Taiffun for 100 turns. UoC fan from the beginning, I was sceptical when I first heard that the new game would done with 3D graphics – but this looks simply beautiful. Great design with a keen sense of style and usability. O boy o boy o boy, this is AWESOME!!!! Come on, lemme buy this thing. Please, please, PLEASE!!!!!! From everything I’ve read on this blog so far this sounds like the war game I’ve been dreaming of designing myself for years now. What happened to the monthly schedule of Dev Diaries? I know you and your team must be really busy, but you surely have loads of interesting things to talk about. Judging by the lack of commenting, I would like to think that you’re working on the next dev diary. Sorry about the lack of updates folks. We were busy preparing a playable build for the Reboot Develop conference in Dubrovnik in April (http://www.rebootdevelop.hr/). We were showing the game there and doing some playtests with the help from our fellow developers. Thanks to all who participated! There’s much to talk about, and I should really write it all up, but just as a quick update, this is what’s been going on. We’re very much ploughing onwards.